This iDevBlogADay post is about Luna Soul, the game I made during the game jam at the 360iDev conference last week. I really want to keep this post short, so I won’t go into too many details about 360iDev itself. I could spend more than a few paragraphs just talking about all the things I ate, but instead I’ll summarize the whole conference: it was great. I loved learning and being inspired by presentations, I loved eating copious amounts of meat and fried food, and I loved hanging out with “old” friends and meeting new ones that’d I’d previously only known through Twitter. A game jam is usually where a bunch of people get together and make games over a short period of time, and the 360iDev game jam was no different. It started on Tuesday at 8pm and went through the night. There was no defined end time, except that the games had to be done by noon on Wednesday so they could be presented to everyone else. This was a pretty crazy schedule, especially considering that Wednesday was a regular conference day. The theme for the jam was “opposite”, which was announced at noon on Tuesday, giving everyone about 6 hours to come up with a game idea. I had already decided that no matter what the theme was, I wanted to make a “freemium style” game. This isn’t really because I enjoy that kind of game, but more because I wanted to try that genre out so I could learn more about it. I struggled with combining “opposite” and “freemium” for a while, and actually didn’t come up with an idea until 45 minutes *after* the jam had started. I considering things like magnets and “opposites attract”, but it wasn’t until I thought about actual opposites, like “hot and cold” and “up and down”, that I found my starting point: “night and day”. I spent the first 7 hours in the jam room, and the last 5 in my hotel room, where it was quieter, finally finishing at 10am. 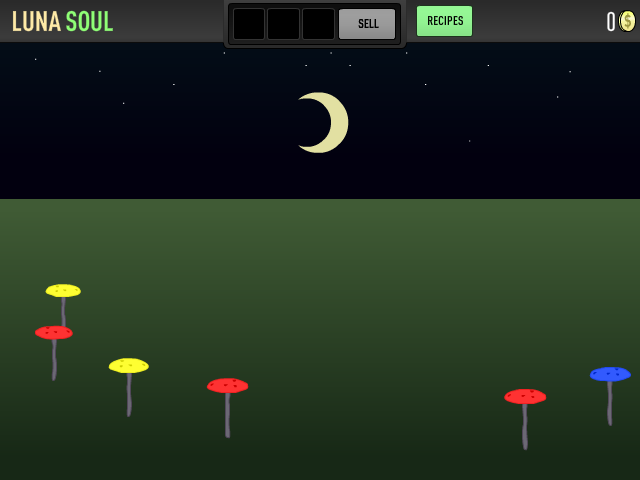 The result is a game I call “Luna Soul”, a play on luna (moon) and sol (sun). The game features a constant day-night cycle. In daytime, flowers grow, and at night, mushrooms grow. Your job is to harvest both types of plants and combine them as herbal “recipes”, which you then sell. 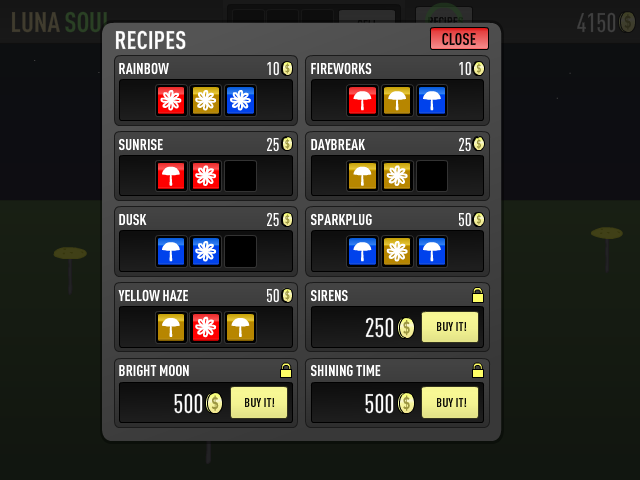 You can use the money from selling plants to buy more complicated recipes. I developed the game in Flash, because of just how fast it is to develop in, and because I knew I wanted to have a bunch of animations. I used Adobe’s AIR-to-iOS packager, so people could actually play the game on my iPad at the jam. Due to the magic of Flash, you can even play the game right now. This is the *exact state* the game was in at the end of the game jam after 12 hours of work. I haven’t changed anything since then. The final thing I wanted to mention is the music. The multi-talented Phil Hassey (creator of Galcon) brought his fiddle to the game jam and offered to create music for anyone that wanted it. There were four games that ended up using his music, including mine. It really helps to signify the exact change between night and day, and more importantly, it adds a lot of character to the game. I’ve included a video of him performing at the jam below. Luna Soul is far from perfect but I’m pretty proud of how far I got with it. I’m not sure if I’m going to do anything else with the game, but I do have a bunch of ideas for how it could be improved. One last thing: make sure you check out all of the other game jam entries, there were lots of really impressive games demoed at the jam, so it’s worth browsing that site to see how much stuff was made in a single night. If I had to pick a favourite entry, I think it’d be Vocab Bots by Ray and Vicki Wenderlich. Great idea and great execution. Thanks for reading this post. As usual, if you have any feedback, you can post it here or send it to @MattRix on Twitter. Cheers! This entry was posted in Game Design, iDevBlogADay, iOS Development. Bookmark the permalink. Ha, I didn’t know you even took that video. At least I look like I’m working hard. Haha, yeah I didn’t really plan on recording that long, but I once I started I figured I’d just record the whole thing.